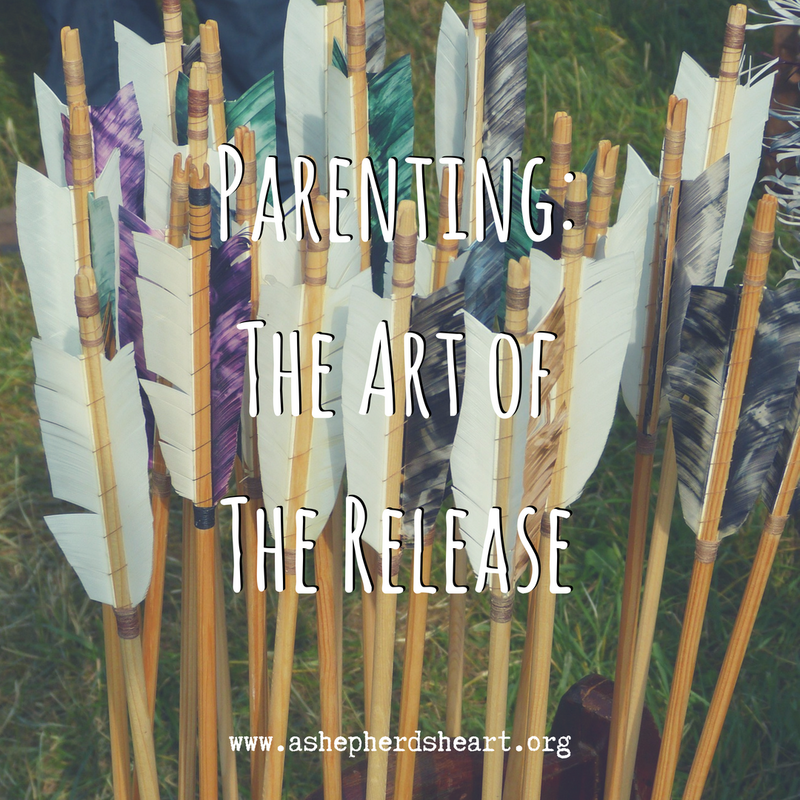 A Shepherd's Heart: Parenting: The Art Of The Release and Other Practical Advice. 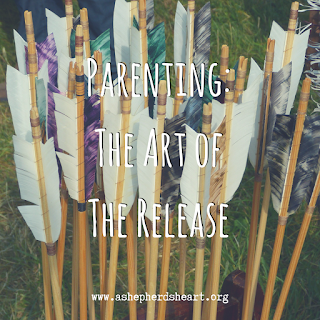 Parenting: The Art Of The Release and Other Practical Advice. Read Proverbs 22:6, 2 Peter 1:3-12, Colossians 1:28-29, John 4:7-14 for an encouragement and challenge from God’s Word. As a parent you learn quickly that there’s no manual for parenting other than of course as followers of Christ, the pages of wisdom found in God’s word. We are also influenced in one way or another by how we were raised. So, each parent does (or should do) their very best to raise their children with the goal of launching them into adulthood, because launching them is the goal. As followers of Christ we strive to model an abiding faith in Christ for our children. However, as they launch into adulthood we have to remember that they have to choose to own their faith and even prior to this they have to own their faith if they are a follower of Christ. Years ago I read a book by Stu Weber titled, “Tender Warrior” and in that book he describes a quiver of arrows. What I learned is that there are different arrows for different weather conditions and as I recall, Stu used this as a picture of how each child is different and we pour into them differently and it's not easy sometimes to remember and do, but from the time they are born until they launch into adulthood we are practicing the art of the release. If you've done any amount of archery you quickly get the mental picture of that release. You have to have a direct aim with parenting and while it’s true that we do need to keep the day-by-day in mind, we also have to keep the future release in mind as we have a responsibility to help launch them successfully. Ultimately we are not responsible for their actions, for the actions they choose, but, we are responsible for pouring as much into them as possible. This doesn’t mean we’re so wrapped up in their lives that we neglect our marriages and don’t continue to build a relationship with their spouses, (keep in mind, once they are launched it’s just you and your spouse if our married and you need to build into your relationship all along and if you haven't...that can make things difficult for your relationship) but it does mean we are responsible to do our very best in God’s strength in order to help our kids become adults. The scripture reminds us that we’re to train up a child in the way they are to go and the hope is that they would turn to the truths that have been instilled in them from God’s word as well as the wisdom and life skills we tried to instill in them as parents. Remember this, as parents, none of us are perfect and we need to learn from our mistakes and grow in grace even for ourselves. We also need to draw from God’s Wisdom and Strength often as parents and consult Him through His Word and prayer. Please drink deeply from God’s Well! As we do, we can build into our children and practice the “release” and speaking from experience, as the day comes more quickly than we imagine. So, you and I better be ready and stay ready building into them as we practice releasing them into adulthood and we can’t do this in our own strength and wisdom alone. Another thing to consider is that you don't have to go it alone with parenting nor should you. You should seek out and learn from the wisdom and experience of other parents who are at different stages in parenting or stages ahead of you as you progress forward as well. You can and will be used in the lives of other parents too! Keep pressing forward and practice the good form of release just like and archer does. You Need To Leave Your Past Behind! He Left The 99 for You.